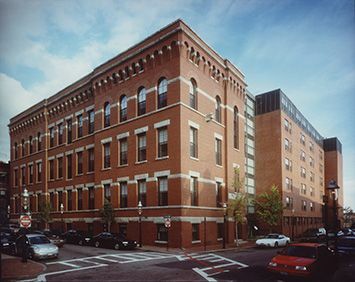 Constitution Co-op is nestled in the historic community of Charlestown, Massachusetts and was built in the heart of City Square. This co-op is located directly on the Freedom Trail and is only minutes away from the historic Bunker Hill Monument and the Charlestown Naval Yard, the final resting place of the U.S.S Constitution, the oldest commissioned ship in the US Navy. Constitution Co-op is a 7-story, 120 unit affordable senior community designed for resident members aged 62+. In addition, there are a limited number of mobility impaired units for those that qualify over the age of 18. It is also recognized as “A Community of Quality” by the National Affordable Housing Management Association. This co-op was completed in 1985. Constitution Co-op Apartments does not allow smoking in any common areas, and within 25 feet of the building. Members in this community enjoy participating in many activities; bingo, card playing and craft making just to name a few. There are events and parties which include lunches, dinners and of course, desserts. Private spacious apartments, some of which are appointed with 10 foot tall windows, are a serene oasis for resident members to enjoy while living just a few minutes away from downtown Boston. Constitution Co-op is located on two MBTA bus lines and is just minutes away from the expressway. Constitution Co-op is affordable for everyone. Every unit is subsidized and resident members pay only 30% of their income for rent. So don’t wait! Call the leasing office to schedule a tour and join us today! Constitution Co-op is proud to be recognized as a NAHMA Communities of Quality Corporate Partner. This designation is for multifamily properties that have achieved a high standard of excellence in the way they are managed, the services they provide residents, the experience and training of personnel, and other criteria.